Cartagena, Colombia. The Executive Committee of the International Baseball Federation celebrated its first meeting of 2013 in Cartagena and welcomed Curacao and Saipan as the newest National Federations of the baseball family. Saipan, however, will need to submit the official name of its national federation to the IBAF for final approval. 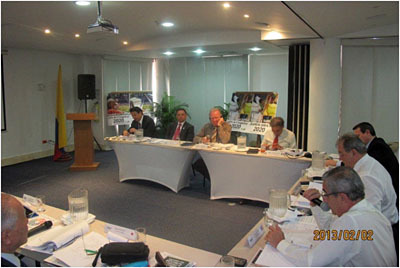 One of the central themes of the executive meeting, which was organized under the patronage of the municipality of Cartagena in cooperation with the Colombian Baseball Federation, was the report on the merger with softball and the review of the constitution that will govern the new international federation, The World Baseball Softball Confederation. A detailed report on the baseball-softball merger and the associated bid to be on the 2020 Olympic Games Programme was presented and discussed thoroughly. "The results we have achieved [with the ISF] so far is a direct reflection of the cooperation and strong alignment with our softball friends," said President Fraccari. "Establishing the structure of the new Federation, while simultaneously building a stronger and stronger 2020 campaign calls on us to work with a shared vision and for us to put the best interests of the WBSC first," Fraccari reported. Another important issue on the agenda was the 2013 tournament calendar, with the hosting rights of the XXVI 18U Baseball World Cup being announced. Taichung (Chinese Taipei) will be the site of the 14-team event that will begin at the end of August and run to the first week of September later this year. There will be no home plate collisions allowed in the 18U event, the IBAF leadership announced. The Executive Committee reviewed new sports medicine studies and consequently decided to remove the ban on curveballs (off-speed pitches) in the 12U and strengthen policies on pitch counts to help protect the athletes participating in the said IBAF event. The Executive Committee approved the IBAF Tournament Bid manual, which outlines the procedure and names the obligations for successfully securing hosting rights of the various world championships. The Executive Committee announced the appointment of Michael Schmidt of Austria as Executive Director. Schmidt will be based in Lausanne and will be taking over the day-to-day operations of the IBAF. Nippon Professional Baseball will host the next gathering of the Executive Committee on April 13th in Tokyo (Japan), one day before the XXVII IBAF Ordinary Congress.